Conscious shoppers are the missing ingredient in a more inclusive global supply chain that breaks the cycle of poverty for small farming families. In January of 2012, my co-founder Kwami and I found ourselves in the middle of rural Ghana, puzzled by a paradox. There are 1.5 billion acres of fertile uncultivated land in Africa and 120 million smallholder farmers living on that land earning less than $2 per day. It was not for lack of natural resources that these farming families were trapped in a cycle of poverty - beautiful, rare, nutrient-rich botanical crops were all around us. The farmers introduced us to one crop in particular that caught our attention - moringa. Moringa is known locally as the miracle tree. The leaves of the tree contain, per gram, more vitamin A than carrots, more calcium than milk, more protein than eggs, and more iron than spinach. The seeds of tree, rich in antioxidants and moisturizing agents like behenic and linoleic acid produce one of nature's finest anti-aging and moisturizing treatments for hair and skin care. Even the waste product of oil processing, the pressmeal, could be used for organic fertilizer, animal feed, and flocculant to purify water. So if farmers had all of these incredible natural resources like moringa growing in their backyards- why were they still poor? And why had so few people heard about the benefits of crops like moringa? It didn't take many days in the village to realize that smallholder farmers had the deck stacked against them. They lacked access to reliable financing and inputs like seeds and fertilizer to start new farms. They lacked information about how to grow crops up to the standards of the international market, and about how to maximize their yields. Farmers were risk averse from being told time and again by companies, NGOs and their government to grow particular crops, only to find their was no market for their produce when harvest time came. It became clear that if we wanted to bring moringa to the masses, and do it in a way that included farmers earning less than $2 per day, we had to reimagine the entire supply chain. This meant building deep relationships with farmers- mapping their farms to determine the yields they could expect and the amount of inputs like seed and fertilizer they needed, and providing constant follow up with a dedicated agricultural extension officer. It meant creating a proprietary processing system so value could be added and jobs created locally. It also meant building a brand and products that would resonate with customers around the world. With all of this in mind, True Moringa was born. From the outset, we realized that our work, though important to the communities we serve, was a drop in the ocean. 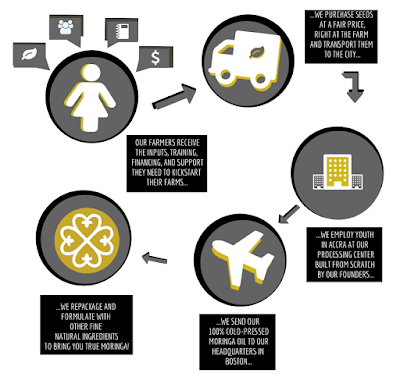 We were founded with the intention of joining forces with companies who are doing their own work to build holistic and inclusive supply chains, but most importantly to create products that you actually want and use- products that stand alone even without the social impact story behind them. We are so excited to partner with Alaffia and Madecasse- two companies that go above and beyond fair trade to truly get to know and co-create with the communities they serve- this holiday season to bring you our True Moringa Holiday Gift Box. Each box contains ethically sourced and produced Madecasse chocolate, Alaffia shea moisturizing lotion, and our peppermint moringa oil. It’s our first foray into building a larger more-than-fair trade movement - and we can’t wait to hear what you think! Remember that you vote with your dollars for the type of world you want to live in- even the most elegant and ethical supply chains mean nothing without you. The future of the more-than-fair trade movement rests with conscious consumers. True Moringa works to provide food security and sustainable livelihoods to over 1,000 small farming families throughout Ghana. Purchase their holiday gift box with free shipping nationwide (using code 'HOLIDAYSHIPFREE' here. I really admire your team because you have the heart to help those farmers improve their lives by giving them the opportunity to utilize their skills and resources. I hope you were able sell a lot of your products. Good luck! Thanks a lot for the great tips here, I really enjoyed reading them a lot, make sure to check this extraessay review here to avoid fake & scam services. I actually have never heard about moringa as well, so thank you for enlightening me on this topic :) And that gift box looks really good, that's a pity I have missed the opportunity to get it. If you own a computer made by Apple, for example, you cannot run a PC game on your system. Particularly, if you aren't paying attention.